“Made in Germany” is a designation of origin that was initiated in Great Britain at the end of the 19th century, as a means of protection against imported German goods. Today “Made in Germany” is an internationally acclaimed hallmark of excellence for product reliability, inventive spirit, technical know-how and a long tradition of craftsmanship in highest masterly quality, coming from Germany. 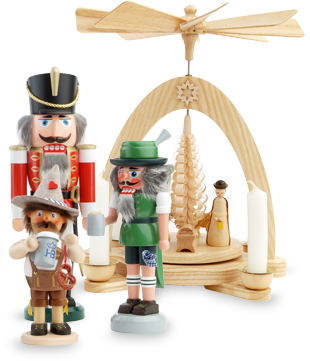 The nutcracker figure, in its perfectly shaped artisan and manufacturing form, has been known in the Ore Mountains since the middle of the 19th century. Wilhelm Friedrich Füchtner, who came from Seiffen, is considered the creator of the first turned Ore Mountains nutcracker. He modelled his nutcracker on the one found in the 1851 picture-book "King Nutcracker and poor Reinhold", by Heinrich Hoffman. Within this context, it goes without saying that the pyramid may not be forgotten: It, too, belongs to the Seiffener artisan tradition. Both young and old marvel at the filigree miniature worlds and the lovingly carved and turned details – looking on in mesmerisation while the slowly rising heat from the candles triggers the gentle, smooth rotation of the wings. And contemplative calm descends... By the way, the origin of the Christmas pyramid can be traced back to the Middle Ages. Home of the salt-glazed stoneware stein mugs is the "Kannen-Bäckerland" in the Westerwald area, facing the River Rhine. The clay deposits found here offer ideal prerequisites for manufacturing the stoneware, which is well-known throughout the world. In the course of many centuries, the artisan dexterity of the Westerwald potters, who are known as so-called "Euler" or "Kannenbäcker", grew, and their manufacturing methods, which have become tried-and-tested over time, have retained their tradition to this very day. In so doing, during the last decades, they have gained growing recognition and appreciation worldwide among the connoisseurs and aficionados of traditionally beautiful artisan workmanship. 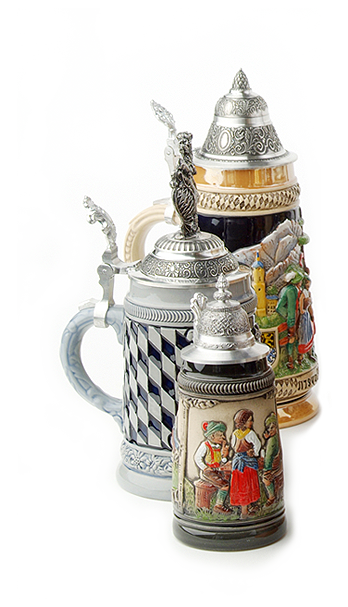 A beer stein made in Germany is not merely a product leaving the workshop, but a product that epitomises living traditions, diligence, attention and craftsmanship. A lovingly crafted beer stein passes through numerous stations, moving from hand to hand: It starts with the initial design, then moves to the model workshop, before entering the clay casting oven. This is followed by the cleaning of the blue and the application of the glaze, the artistic painting that is then baked and thereafter, in a final step, the stein is given its lid – this is how handmade in Germany works, and this is how beautiful products are created that remain a joy forever. To this very day, there are different opinions as to who was the first to develop the Black Forest cuckoo clocks. However, there is no difference in opinion regarding the fact that these were Black Forest clock makers – somewhere between 1730 and 1742. The reason for this can probably be found in the following incident: The elector August of Saxony once owned a cuckoo clock; this was mentioned by the Augsburg patrician Philipp Hainhofer in 1629, on a trip to Dresden. Time-delayed, in his widely-known music handbook, Musurgia Universalis (1650), Athanasius Kircher described a mechanical organ with different automatons, among them also a mechanical cuckoo figure. This cuckoo automatically opened its beak and moved its wings and the tip of its tail. At the same time the bird made its typical cuckoo sound, which was generated by two organ pipes that were tuned to a minor or major third. The Black Forest inhabitants have always been deft with wood and with carving wooden clock mechanisms with unique precision. Only very much later, step by step, did metal and brass replace the wooden components of the clock mechanisms. There can be no doubt that these “Wäldlerkünstler” (forest artists) can be described as masters of process optimisation and time management – although the clocks were manufactured entirely in manual labour, the number of clocks manufactured per person sextupled in fewer than 100 years. As demand increased, so did the distribution and logistics problems – while, before 1800, the masters would still carry a number of clocks on their backs, travelling from valley to valley, the years 1800-1840 were characterised by unbridled growth. Of course the absolute epitome of the Black Forest clocks is the cuckoo clock – and the type of clock that closest resembles the present-day collectors’ clocks, dates back to the “Bahnhäusleuhr”, which was designed around 1850 and was the result of a design competition initiated by the Furtwanger clock-making school. 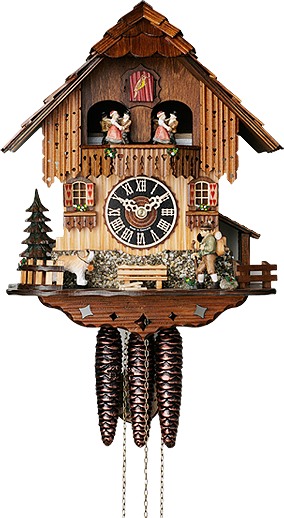 Today our cuckoo clocks can be found throughout the world in different designs – and with them time seems to pass in a particularly homely way... probably due to the fact that we still, to this very day and without exception, manufacture them close to our headquarters in Titisee-Neustadt.